Unique sound hole: earplug type loudspeaker diaphragm with rigid and flexible material, to minimize the loss of sound and increase the output of voice. The carefully arranged acoustic blowholes add a lot to the original first - class sound quality, and the air holes on each headset can let the gas in the headphone tube as the sound cavity be dispersed. 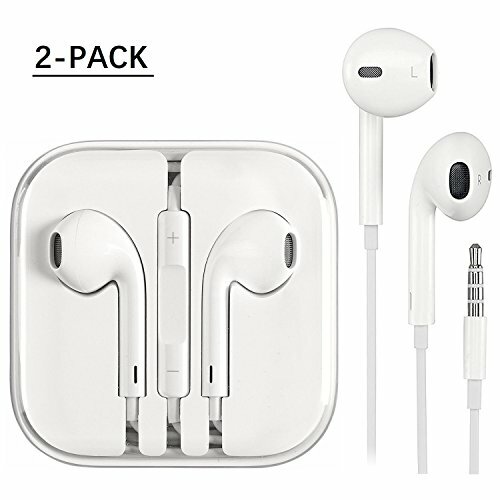 Voice outlet: this earphone has two outlets, which can produce sound independently, and the smaller sound outlet increases the role of sound field. Sound quality characteristics: Bass heavier, richer, stronger sweat proof and waterproof performance, control music and video playback, answering and hanging phone. Fashionable earplugs - comfortable ear design with smooth and soft cables.. Tangle Free cord and soft touch feeling, giving you a frustration-free listening experience. Easy to use buttons,allows Play/Pause on your music tracks as well as all phone use without touching your phone,slide the volume button to control the music volume,good in feeling. Microphone and volume control are independent buttons, that help the microphone accept the voice better, and reduce the influence of noise. TPE high elastic stripe wire material, resistant to low temperature and permeability, that won't turn hard or variant,smooth grinding wire drawing line design. Use ergonomic design, conform to your ear's shape to stay comfortably in all day, also that won't slip out. If you have any questions about this product by Maongo, contact us by completing and submitting the form below. If you are looking for a specif part number, please include it with your message.